I downloaded the Dan Murphy’s smartphone app this weekend and was quite surprised with the professional looking and functional app that they have produced. 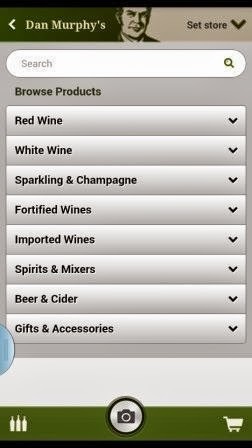 The app screen makes it easy to browse and search the store for wines, beers and other alcohol and the weekly deals etc. are conveniently placed just in reach of a quick tap on the screen. Right now they are offering the special smartphone application launch deals… so go grab it. When i checked on my phone there was the “ Yellowglen Vintage Perle” white wine award winner for $89.40 for a case of 6 bottles with delivery. That brings the price down to $14.90 for a bottle for this classic vintage wine (definitely a good deal to get delivered to your home). In 1952 a bright young man, Daniel Francis Murphy was working in a liquor store owned and run by his father Timothy Murphy. Dan looked around one day and decided that he could run the shop better than his father and requested to take the reins and the rest is history. Today he has about 140 stores all around Australia and it is part of the Woolworths chain. I tried out a special feature on the Dan Murphy’s app, this app has got label recognition technology built in to the app. 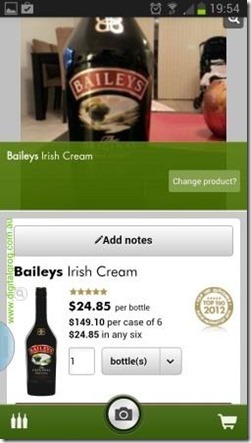 If you just click a photo ( via camera icon/button in app- see pic below) of a label of the bottle in your bar or fridge and if the item is stocked at Dan Murphy’s, the app will come back with the current price of the bottle and also provide information and reviews on the drink ( pretty neat huh). This new app from Dan Murphy’s could possibly do wonders for many undiscovered small brands or relatively unknown wineries, by bringing them into focus and increasing their audience by putting them on show to the world. With an increasing number of smartphone users now using their devices to research products or services on-line, apps like this one are becoming the norm for tech-savvy shoppers. 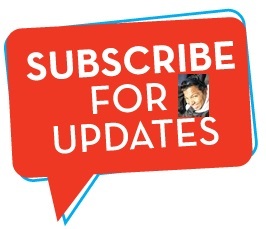 The Dan Murphy’s App is free to download onto your android and apple devices. Customers can download the Dan Murphy’s App for free on their iPhone or Android device by searching for “Dan Murphy’s” in the App Store. 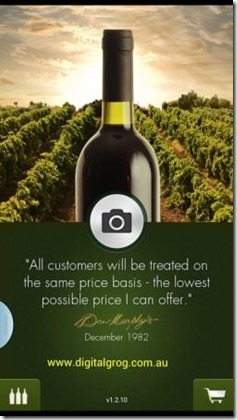 For more information on the Dan Murphy’s App and to view an instructional video, please visit:www.danmurphys.com.au/guides/app-content. Is this an Australian app ? Bit suprised that they came up with this but I love it!